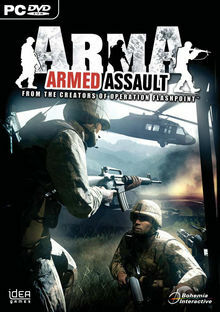 ArmA (full title ArmA: Combat Operations in North America and ArmA: Armed Assault in rest of world), a new game from the developers of Operation Flashpoint, is a first person tactical military shooter with large elements of realism and simulation. "We aim to again deliver the ultimate military simulation for PC, improving the successful gameplay formula of our debut PC game release Operation Flashpoint. It's refreshing for us to focus again on PC game development after years spent working on the Xbox platform and we work hard to make sure not to disappoint the expectations of the great community that built around Operation Flashpoint with this new game." - Marek Spanel, director and co-founder of Bohemia Interactive. This page was last edited on 25 May 2008, at 07:53.